Where’s Art talks to Israeli artist Hilla Ben Ari and Italian Alice Cattaneo about their collaboration project “Tensioni Estatiche” (Ex-static Tensions) presented at Galleria Marie-Laure Fleisch in Rome. Both the two artists share the interest in the notion of body and investigate the way it appears phisically and metaphorically as, simultaneously, a content and a container. 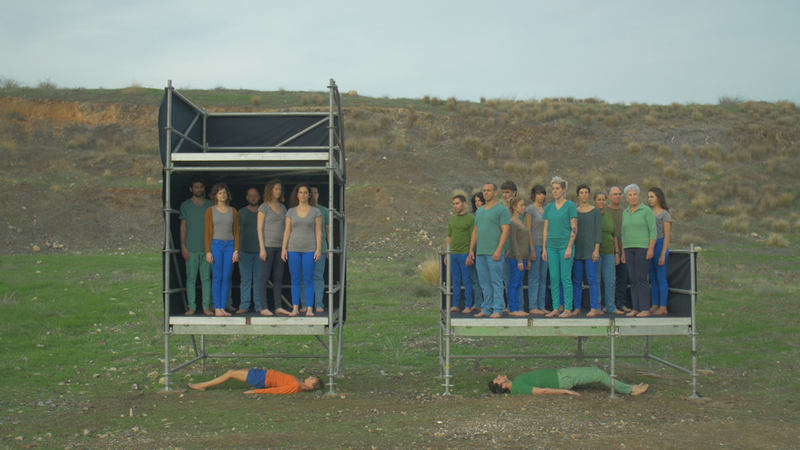 Hilla Ben Ari, ‘Na’amah: A Tribute to Nachum Benari’, 2015, Video still (video, 14’17”). Courtesy Galleria Marie-Laure Fleisch and the artist. The element of the body is very present in Hilla Ben Ari’s work, while the same seems to be missing in Alice Cattaneo’s. Can you both tell us more about the selection of works and how did you conceive your duo show “Tensioni e-statiche” at Galleria Marie-Laure Fleisch? Hilla Ben Ari (HBA): I conceive Alice’s works as a research on the body, although it does not include a specific image of the body. As I see it in both of our work, there’s the question about the presence, the control of the body and also the question of how to stand, metaphorically and physically. I think we both create a metaphor through a very strong focus on a bodily physical aspect. Alice Cattaneo (AC): I’m interested in the synergy that a sculpture establishes in a predefined place. I think of a medieval wooden sculpture of a Madonna and Child that I have seen in a museum in Matera a few years ago. The Madonna had on her face a crystallized thought and the child sitting on the lap seemed to take a leap from the mother’s body. There was a physical and emotional distance between the two figures that somehow conveyed a sense of unity: they cohabited the same area with different energies. The sculptures in this show follow this sort of non-logic of unity and detachment. Hilla Ben Ari and I didn’t know each other before the exhibition. For me the selection of the sculptures happened very spontaneously: once in the space of the gallery the two works seemed to establish a sense of continuity together, even dough they had different origins and approaches. How did you find yourself confronting with each other on both the cultural and artistic level? HBA: We didn’t know each other till the installing of the exhibition, it was Marie-Laure’s idea to bring our works together under this topic. I think we both found it very interesting. It’s great that the works can be free from my perceptions sometimes. It can lead dialogues and ideas which I wouldn’t reach by myself although it requires kind of letting go. Anyway, I think we both explore similar issues from a different approach, and it’s interesting for me that a dialogue is created between Alice’s abstract work and mine, which brings kind of ‘broken’ narrative. Actually, The Naamah project is the most narrative work I did till now. I usually deal with the body that is placed within a context recalling to mind cultural or social aspects, but in this project I went further. The project is based on the penetrating play that Nahum Benari, the brother of my grandfather wrote in 1951. The play draws from the biblical story of Lamech, his daughter Naamah and his son Tubal-Cain that was the ancestor of the blacksmithing. Nahum constructed the play in the style of a Greek play and made a connection between myths from Jewish sources and the myth of Oedipus and Antigone. The research that I conducted was intergenerational family research with an intimate dimension, and, along with this, touching on myth, gender, history and cultural issues. Speaking of precarious equilibrium and physical force, how is the work of both discussing/ making a point on the very current issue of migration and its related topics of relation, resistance, identity, and landscape recognition, if at all? The play ‘Tubal-Cain’ refers to Noah dynasty before the flood. So it’s a story about the first settlement of the humans according to the Bible. It touches on the foundations of guilt, punishment and the tension between creation and destruction, between action and sin. Its raise question about how to construct a place for living. In my eyes the play is also refer to the beginning of the Jewish settlement in Palestine at the 20th. I believe that Nahum wrote the play as a critical and actual text and I see it relevant also these days. In addition, one of the issues I usually deal with in my work is the issue of the body and space, and especially the vulnerability of the female body in this context. In The Naamah project I wished to read the play through its gender-based prism, to expand the critical attitudes that are hidden within it and to use it to examine the question of the presence of the female body and its existence in space, all through drawing attention to the silenced figure of Naamah. AC: I experience sculpture as a way of “depositing” the surrounding and of relating to what is generated by the world around. For me it’s important that my work once placed in a context is perceived as an opaque presence, which does not reflect the reality on its surface but rather absorbs it giving back a new perception of it through the materials. I try to maintain an awareness of the context without necessarily transforming it: it is rather about a process of familiarization with the elements that define a situation. The connections between things have always been sources of great questions in my work. So I’m interested in the friction that raw materials produce in the moment they relate in their original state. Therefore it is not the constructive invention that create the work but rather the meaning that each connection and union encloses. It is through this tension and this effort that I reflect on the question of balance. Hilla, what does the body represent in your research? And why do you see it as a “battleground” in your body of work? HBA: The female body as a crossroads of political and cultural contexts is at the core of my works. 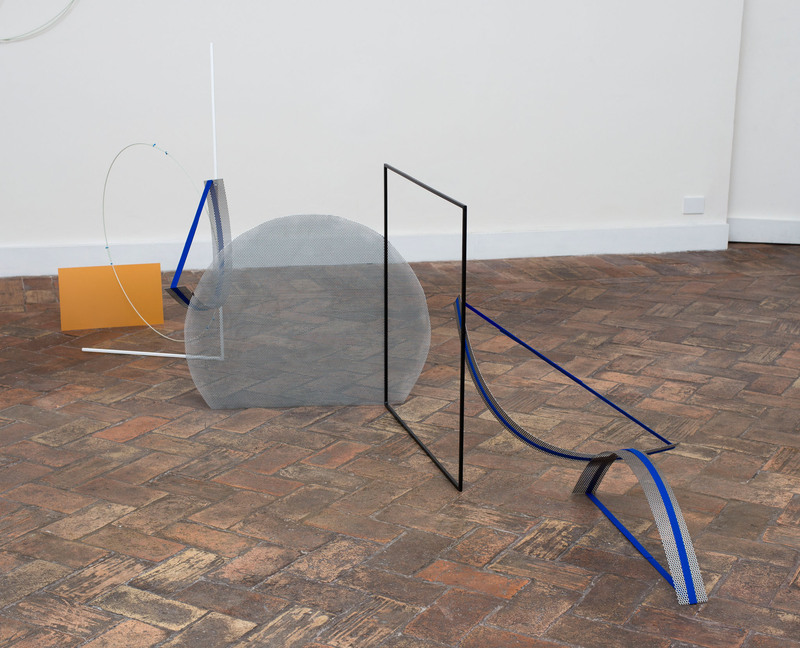 The works deal with the limitations of the body and questions of boundaries and space, and they present the body as a conquerable sphere, which is nevertheless – despite its weakness – trying to occupy a space as well. Alice Cattaneo, ‘Untitled’, 2015, Iron, paint, fiberglass, cable ties, plastic, velcro 140 x 300 x 150 cm .ca. Courtesy Galleria Marie-Laure. Photo: Giorgio Benni. 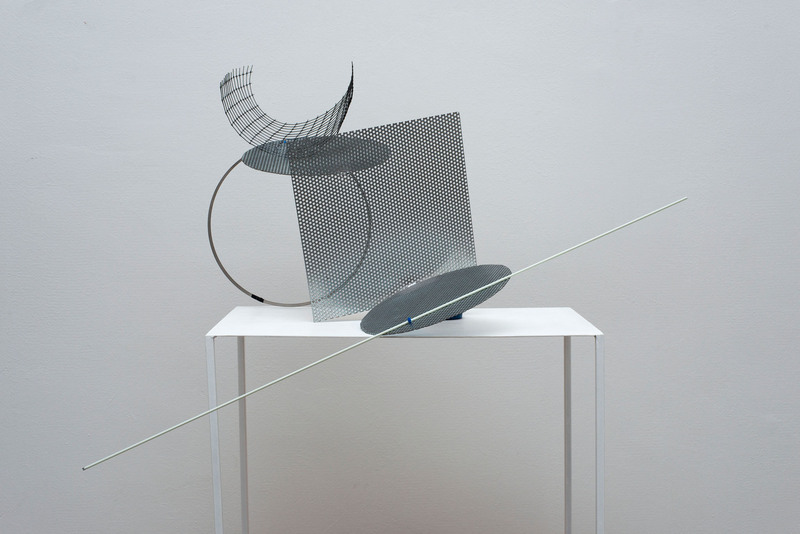 Alice Cattaneo, ‘Untitled’, 2015, Iron, paint, cable ties, plastic mesh, fiberglass rod, scotch 180 x 80 x 50 cm ca. Courtesy Galleria Marie-Laure Fleisch and the artist. Photo: Giorgio Benni. Alice, your compositions show an interest of yours in the concept of suspension. Would you explain what does it mean for you and why is it so relevant in your research? AC: My work is moving along two parallel tracks: the image that originates before the work itself and the material that suggests a gesture. These two worlds at one point meet and through their reaction to physical space and contingencies they become ideas. So the work goes through continuous changes, failures and new beginnings. It’s like dealing with a stunning landscape in front of you: you experience the impossibility to see it in its totality, you are stuck in front of its vision. After this sort of blank experience, something starts to happen and you can perceive the first details. My work originates from this kind of contradiction that makes things dwell in the suspended space existing just before a real perception of the world. Also at one point of my research I approached some architectural models of the early ’20s of a group of Russian artists and designers gathered under the name of Wkhutemas. What fascinated me was that these models now exist only in the form of tiny anonymous photographs. They represent potential un-built architectures that inhabit the imagination in the form of continuous drafts, suspended in time and hypothetically parallel to the contemporary city. There is a sense of time and rhythm in these images that helped me to describe my way of understanding and conceiving sculpture and the spaces that it generates and reflects. So sculpture is for me a way to bring these ideas and mental images back to the ground, returning them to a palpable dimension. 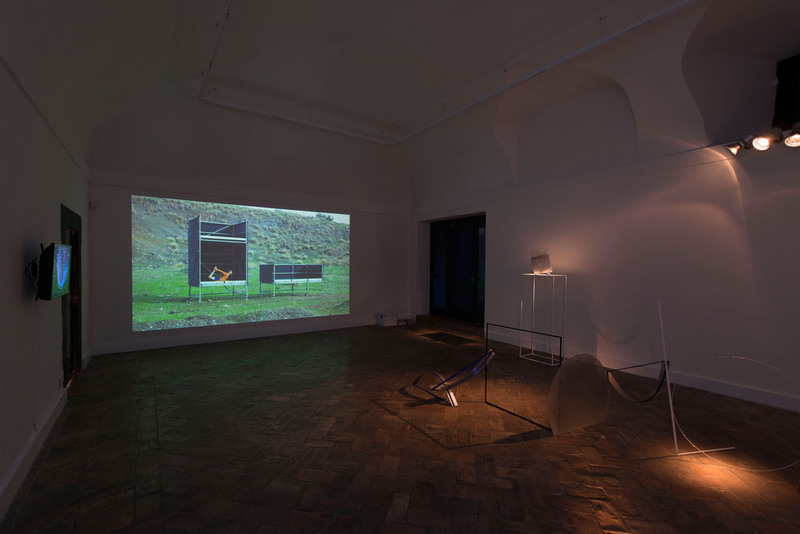 Tensioni E-Statiche, 2015, Installation view at Galleria Marie-Laure Fleisch. Courtesy Galleria Marie-Laure Fleisch and the artists. Photo: Giorgio Benni.